Welcome to Whatbird, Kathy. I'm going to suggest Eurasian-collared Dove. The placement of the necklace is different, but size and color are close and there's no spots on the belly/breast. Blue Jays also have a necklace. Thanks all for your help. I looked at the Eurasian-collared Dove. Very similar except the necklace location is wrong - it was under the “chin” like a flicker. The bird we saw was not blue. This may be a stretch, but is Red-whiskered Bulbul an option? It could be an escapee. No, didn't have a crest like the Bulbul. 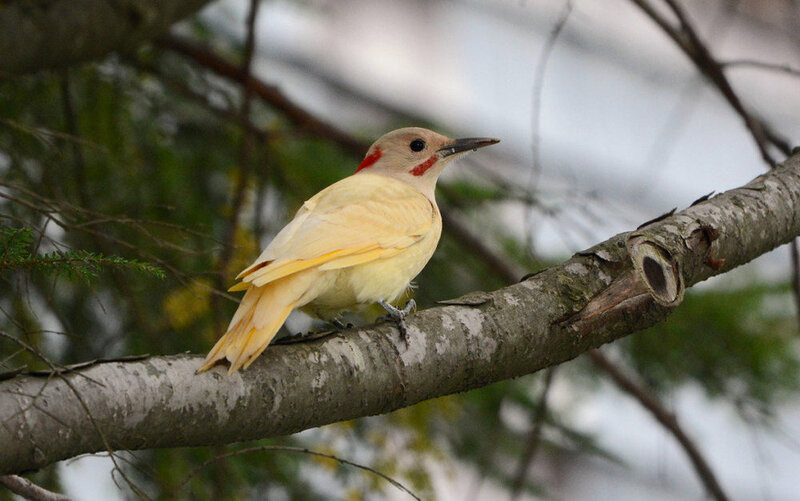 While searching online I found this pic of a partial albino flicker. My bird didn't look like this either - it still had the black necklace & wasn't yellow. But it made me wonder if there were other color mutations? OK, however, a female Varied Thrush would not be a bright orange but more of a pale-muted orange. Another thing to take into consideration is that in the field birds often look smaller/larger than they really are especially if they are on the ground.